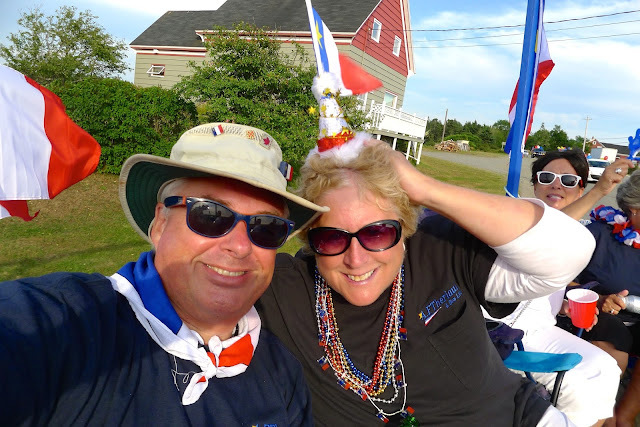 We first met Larry at the 'Festival Acadien de Clare' wine and cheese party on Tuesday night. After being introduced and shaking hands, he invited us to ride on his float in the Tintamarre Parade on Saturday. We enthusiastically accepted his kind offer to join his family and friends. We spent Saturday afternoon at Shop 'n Save picking out our festive attire for the parade. I said to Joe, "I hope Larry remembers he invited us to ride on his float for the Tintamarre parade. Otherwise it is going to be AWKWARD showing up in Salmon River looking like this!" Joe replied, "I don't think it is going to be a problem, Nanc. These people don't do awkward." Getting ready for the parade. I almost blew my lips off honking that vuvuzela! Richard picked us up and drove us down to the firehall in Salmon River to the meeting spot. Larry's face lit up when he saw us pull in to the firehall's parking lot. "You made it!" He gave us each a T-shirt to wear and we climbed aboard. We introduced ourselves as Larry's west coast cousins. And we're off! 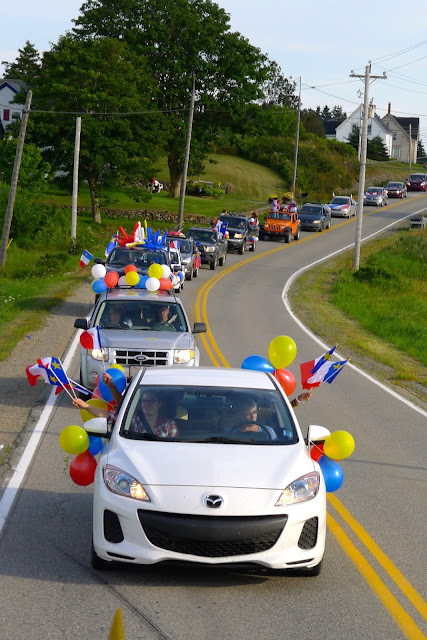 It took an hour and a half to drive the 35 kilometre parade route. Hang on to that fancy hat, Muriel! People lined the highway from Salmon River to Church Point banging pots and pans, drums and all manner of noisemakers. Everyone came out to cheer for the parade. I love the float's shadow on the field. The parade pulled in to the university grounds and we felt like celebrities! Thousands of people were cheering. Waving flags, waving arms. We all stood up on the float and waved back. Larry Theriault, a prince among men. Thank you Larry for showing us such a great time. You have no idea how much your invitation meant to us. Being included in the Tintamarre Parade was the highlight of our holiday on the French Shore. We had a blast with you, your family and friends. Thanks again for making us feel so welcome in Acadia.